BANGKOK, THAILAND - JUNE 22, 2017: People are shopping in Fashion Island Shopping Mall Bangkok. hd00:11CHIANGMAI, THAILAND -OCTOBER 21 2016: Uniqlo store. Uniqlo Co., Ltd. is a Japanese casual wear designer, manufacturer and retailer. Footage at Central Festival chiang mai. hd00:08HONG KONG, CHINA - MARCH 31, 2016: Hangers and shelves interior of a fashionable clothes store boutique in Hong Kong mall. hd00:14CHIANGMAI, THAILAND -OCTOBER 21 2016: Uniqlo store. 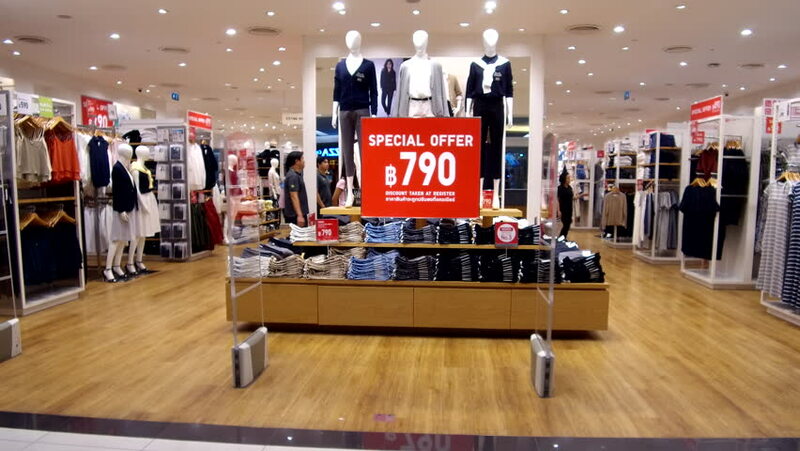 Uniqlo Co., Ltd. is a Japanese casual wear designer, manufacturer and retailer. Footage at Central Festival chiang mai. hd00:12KUALA LUMPUR, MALAYSIA - CIRCA JUNE 2014: Ermenegildo Zegna outlet, Suria KLCC, Petronas Towers. Ermenegildo Zegna is an Italian luxury fashion house, specializing in men's clothing, founded in 1910.